Attracting birds with a koi pond is inevitable. Song birds and exotics are welcome, but the water also attracts predatory birds. Predators are capable of killing your entire population in a single sitting. Birds will sometimes remove all of the fish from the pond and only eat one before moving along. The water in your pond is a natural bird attractor. It will also attract reptiles, insects and mammals searching for a drink of water. Make the area around the pond friendly for wanted birds. This turns the pond into a sanctuary and provides excellent bird watching. Plant trees and shrubs near the pond to provide nesting and cover from the elements. Place feeders with seed near the pond and add perches overlooking the water. Avoid attracting predatory birds by adding decoys. The decoys double as a creative addition. 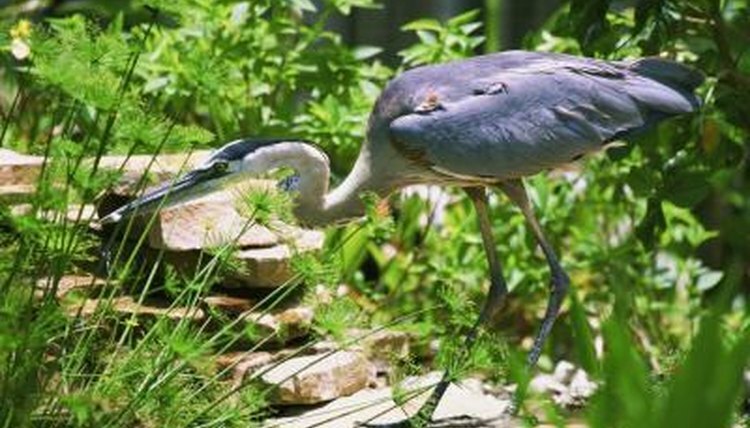 The blue heron decoy is a good choice as the birds are attractive and have a majestic stance. The decoy helps prevent other herons from landing but it's not a foolproof system. Add a scarecrow as a second line of defense. The manlike presence is an effective means of repelling predators. Netting is the ultimate defense against fish-eating birds. The small song birds are able to drink through the netting but large birds cannot access the fish. Netting does retract from the beauty of your pond -- but it will save the fish. Use the netting when the predators are active and migrating through your region. Spring and fall are common times of vulnerability for the fish. The netting is also effective for catching leaves in the fall. Adding structure to your pond provides safe hiding for the koi. Rock ledges are ideal, and deep structures provide escape zones from predators. Plan for predation when you build the pond. If your koi are exposed and suffering from predation, you may have to drain the pond to build new structures and hiding areas. Prepare to transfer and store the fish in a safe holding pond while you work on the new structures. The Water Garden: Herons, Racoons and Other Predators Want Your Fish!